I grew up on the on the East Coast in a family that encouraged my love of music and gardening. Some of my happiest childhood memories include playing the piano endlessly for my parents' enjoyment and helping my grandfather pick gooseberries and tomatoes in his kitchen garden in New Jersey. I began my college education at Mount Holyoke College with an emphasis in music but transferred to Columbia University in my junior year and graduated in 1965 with a B.S. and an R.N. I worked for five years as a nurse in Chicago and New York where I married and our first child was born. In 1973 my husband and I relocated to Del Mar. Since I wanted to spend more time with our children, I began giving piano lessons in our home. I was also finally able to plant a garden of my own and experience the thrill of making things grow. To learn what plants would thrive in this unique climate and how to care for them, I enrolled in a program of Ornamental Horticulture and Landscape Design at Mesa College and took every course that was offered. It was pretty clear, after spending four years of study, that a career as a Landscape Designer could combine many things I loved: gardening, math, art, problem solving and helping people. In 1981, my first design project was an Ornamental Edible Garden that won the Grand Prize in the landscape division at the Del Mar Fair. That was the springboard I needed to launch an incredibly rewarding career. I have since designed nearly 800 gardens for residential clients throughout coastal San Diego County. These projects range from courtyard gardens for condo owners to complex landscapes for large estates. I emphasize drought-tolerant designs that are appropriate to the Mediterranean climate that San Diego enjoys. I have also enjoyed writing and lecturing about how to garden in our special environment. In 2013, my husband and I purchased a home on 40 beautiful acres in Woodstock, Vermont. We will plan to spend our summer months (when the leaves are on the trees!) in this lovely rural setting, which has an abundance of tree varieties in our mixed hardwood and softwood forest. I am on a steep learning curve to acquire the knowledge I need to take care of the trees, shrubs and perennials that thrive in this zone 4 climate. I’m especially excited to reacquaint myself with peonies, rhododendrons, lilacs, magnolias and some of the other most loved plants from my Pennsylvania childhood! We may even try our hand at making maple syrup from our many acres of sugar maple trees. At the very least, we’ll want to be good stewards of this very special piece of Vermont that is now ours. * Linda retired in 2016 and is no longer designing gardens. Let me help you design a beautiful garden! Whether you want bright colors, fragrant, intimate spaces, a quiet retreat, flowering trees, herbs, or tomatoes, I can help you develop your property so that it reflects your personality and takes advantage of San Diego's splendid climate. Over the past 30 years I have helped hundreds of San Diego families create private gardens that are lovely to look at, extend their livable space, and fit their budgets, large or small. Typically, these gardens are filled with colorful, multi-textured plants offering an abundance of seasonal interest. I use plants that are native to San Diego and other Mediterranean climates. I encourage organic gardening practices. I have written gardening columns for local magazines and newspapers. My gardens have been featured in Sunset, Better Homes and Gardens publications and others; many have won awards for their beauty and drought-tolerant design. • "Time to think about tomatoes"
• Sun-Kissed Paradise: Looking back on some great gardens of San Diego. San Diego Home Garden Lifestyles, May 2009, p,94. 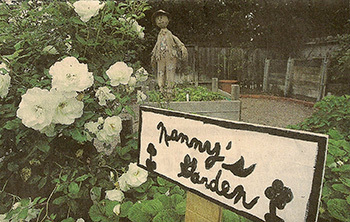 • "Chisari Creates Magic in Local Gardens"
• "Gardens of the Year"
by Cathy Hendrie, Del Mar Sun, October 6, 1995.
by Karen Wilson, San Diego Union, April 9, 1995, p. H-13. (Dawson Garden) by Bob Smaus, Los Angeles Times, January 23, 1994, pp.24-25. • "Make Gardens with Less Water"
Del Mar Surf comber, 1992. (Grier Garden) by Bob Smaus, Los Angeles Times Magazine, December 12, 1992, pp.54-55. by Pat Stein, Blade-Citizen, April 11, 1992, p. D-1. by Pat Stein, Blade Citizen, August 23, 1991, p.C-1. • "Days of Water and Roses Come to Close"
by Julie Brown, Del Mar Surf comber, March 7, 1991, p. 1. • "Stop and Smell the Flowers at the Post Office"
by Julie Brown, Del Mar Surf comber, March 7, 1991, p.1. • "Life-Saving Tips Offered For Yards"
by Liz Swain, Del Mar Surfcomber, March 1, 1991. • "Garden Club Plans Postal Paradise"
• "Water District Sets Own Example for Conservation"
by Julie Brown, Rancho Santa Fe Times, September 6, 1990, p.1. by Pat Stein, Blade Citizen, July 23,1990, p.C-1. • "Yards That Make Every Drop Count"
by Tom Stacey, Los Angeles Times (North County Focus), June 28, 1990, p.1. Burgener Residence, June 1996, p. 116. Combining Plants, Time-Life Inc., Alexandria, VA, 1995. Gardens featured on pages 2, 78, 79. Practical Guide to Garden Design, Time-Life Inc., Alexandria, VA, 1996. Garden featured on page 32. Torre-Bueno Garden cited in plenary address by Robert Perry at Pacific Horticulture Symposium entitled' Gardening Under Mediterranean Skies', September, 2000, Los Angeles County Arboretum. Petersen Garden featured in San Diego Home and Garden Lifestyles, January 2001.
by Karen Dardick in Homescape, The San Diego Union-Tribune, April 26, 2009. 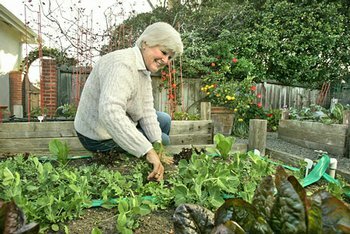 When Linda Chisari is deciding what's for dinner, she goes outside to inspect the crops in her raised-bed gardens. In winter and spring, the Del Mar landscape designer can create salads with various colors of lettuces and savory herbs. Broccoli and winter squash are some of her favorite fall dining options. When fresh peas and beans form, they are picked while small and succulent. Tomatoes star in summer. With more than 24 varieties of tomato plants, Chisari has plenty for al fresco dining and freezing for winter pasta. “It's such a treat to determine your menu by what's in your garden,” she said. Vegetable gardening is the hottest trend in gardening right now. Even the White House is the site of a growing edible garden. And thousands of American households are following the example. But you don't have to own a farm or large garden to enjoy a bountiful home harvest. Raised beds are an easy solution for fresh produce with a minimum of fuss. Tomatoes, squash, cucumbers, sweet or hot peppers, peas, beans, radishes, carrots and chard are just some of the spring and summer taste delights that await home gardeners. In San Diego, vegetable gardening is a year-round adventure. Broccoli, cabbage, kale, lettuce, winter squash, parsley, cilantro are among the plants that thrive in fall and winter. for parking and was covered by asphalt, so they broke the asphalt underneath each bed to allow water to drain into the ground. Each of Chisari's raised beds is 18 inches high and filled with good quality soil. For ease of watering, water lines and hose bibs were installed to each bed. Another important design feature is that beds are set a wheelbarrow space apart. “This makes it easy to wheel soil or compost to create or replenish beds,” she said. First, choose a location with at least six hours of sunlight daily. Chisari advises studying the site since winter and summer sun locations can differ. Be sure that trees or hedges don't shade your summer veggies. Build or buy your raised beds. If you build your own, be sure that you don't use treated lumber because chemicals can leach into your garden. Make sure that the width is no more than 4 feet so you can reach into the bed from either side. Choose a length that fits your site. If you live in an area infested with gophers or rabbits, place hard-wire cloth or similar barrier on the ground, under the raised bed. Commercial products like Earthbox or self-watering planters are a simple and fast method, and especially useful for people in town houses or condos with very limited space. Earthbox is a complete kit containing planting mix and fertilizer; all you do is add plants. The system is self-watering and self-fertilizing. Self-watering planters minimize watering chores and can be placed in optional decorated frames. More information is available at earthbox.com or gardeners.com. 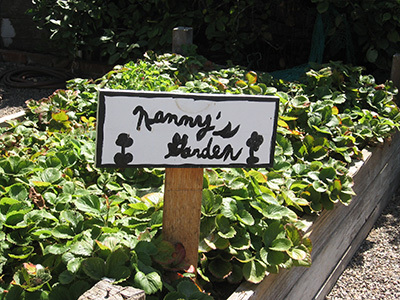 It's true that you can save money and help the environment by growing your own produce. But an even more compelling reason is that there's a world of flavors available to home gardeners that isn't offered in grocery stores. You don't have to worry about growing varieties that survive picking, packing and shipping. Instead, you can choose exotic colors, flavors and textures, especially if you grow plants from seeds. Think haricot verts or multicolored beans instead of standard green beans, purple-stemmed pac choi, or French shelling peas. Carrots in colors of purple, red or white; mild radishes; rainbow hues of chard; and much, much more can be grown right near your own kitchen. Tomatoes are the most popular backyard crop. People who grow their own won't settle for anything else. There's an incomparable taste adventure when eating a juicy, sweet tomato picked at its peak of perfection. Chisari grows 24 to 30 varieties – enough for salads, cooking and tomato sauce. “I find that 90 percent of all my clients who request raised-beds gardens do so to grow tomatoes,” she said. Choose varieties that are best for your region. Coastal gardeners need cold-climate tomatoes. Chisari said she has not had much success growing heirloom varieties because they grow well in heat, not “June gloom.” Inland gardeners will do better with those varieties. When planting your beds, place the tallest plants – like tomatoes – in the center and on the north side of the bed so they don't shade other plants. Then place midsize plants like chard, spinach or peppers in the middle. Line the planter with carrots, radishes, onions and other low-growing plants. You can save one section for herbs, and group basil, oregano, chives and the like together since they require less water. Add a trellis along one side or end, and grow vertical vines like cucumbers, peas and beans. These are easily grown from seeds. If you have space, create two or three raised beds and save one for tomatoes. Chisari rotates so that plant varieties don't grow in the same planter for three years. This eliminates root problems like nematodes. For people with less space, she suggests replacing the planting mix every year. Be sure to feed plants during their growing season. If you plant seedlings, add an organic or time-release fertilizer at the time of planting, according to package directions. Some plants, like tomatoes, need additional fertilizer after fruit set. Chisari uses commercial chicken manure mixed with her own homemade compost. Watch your garden closely and harvest while veggies are tender. Some, like zucchini, can explode in size quickly. Bountiful crops can be shared with friends or be a good excuse to throw garden parties where guests can pick their own dinner ingredients. As Thomas points out, by growing your own vegetables, you can save money on groceries, join the green movement, and know what you're eating. “The more green you grow, the better off we all are,” he said. Karen Dardick is a freelance garden writer. SOURCES: Seedlings are sold at local nurseries and garden centers. For unusual varieties, try seeds from sources including reneesgarden.com or burpee.com. For seedlings, try naturalgardening.com. Experts agree that growing plants in raised beds rather than in the ground simplifies garden chores. Access: It's easier to tend plants when they are above ground level. Even people with physical ailments can participate. Water: Conserve water in raised beds by using soaker hoses or drip irrigation. No water is wasted on paths or lawns, and there's less evaporation. Visibility: It's easier to spot weeds and pests when they first appear. Soil: It doesn't matter what type of soil is in the garden because raised beds are filled with commercial planting mixes. And because gardeners don't walk on the soil, it doesn't compact and stays light and fluffy, enabling plants to develop strong roots for healthy plants and bountiful harvests. Easier care: Weeding, watering and feeding are simplified. Space savings: Small spaces can be converted to productive gardens with just a few raised beds. Vertical space is captured by adding trellises to support climbing plants like peas, cucumbers and tomatoes. You can also place plants close together for increased production. Sun Gold: An orange cherry tomato with a distinctive tropical flavor that sets it apart. Produces long strands of fruit on vigorous, tall, indeterminate vines. Early. Hybrid. Sweet 100: Aptly named, these hybrid cherry tomatoes bear sweet and juicy bite-sized tomatoes in abundance. High in vitamin C, they are ideal for salads, crudites, or straight from the vine. Carmello: A very popular variety. Mellow, sweet, and full-bodied, Carmello bears a large harvest of medium-sized, juicy fruits. VFN Hybrid. Celebrity: A 1984 All-America Selections winner. Absolutely incredible set of exceptionally flavorful, firm 8-to 12-ounce fruit on strong vines with good cover and outstanding disease resistance. Large clusters of consistently large, beautiful tomatoes. Dona: Plant produces good yields of flavorful glossy red, egg-shaped tomatoes. This variety has excellent acid/sugar ratio balance. A gourmet tomato from France. Enchantment: (Hybrid) Cascading clusters of rich-tasting, plump, oval crimson fruits cover vigorous productive disease-resistant vines. Full-bodied, delicious sweet flavor. Green Zebra: A unique and delicious salad tomato. Three-ounce green fruits ripen to amber-green with darker green stripes. The light green flesh is very flavorful, sweet yet zingy. This one is a real taste treat. Juliet: A 1999 All-America selection. Juliet produces lovely, oval, 1-ounce fruits that are perfect for salads, salsa and sauces. These beautiful little fruits have excellent flavor. Highly disease-and crack-resistant. Note: Inland gardeners can grow heirloom varieties and beefsteak like Better Boy. Coastal gardeners need to wait until late June to plant and may have disappointing results if summer temperatures are cool. Nicholas, at the age of 8. When the going gets tough, the tough get growing. We've seen it before ­during World War II and the Great Depression, in the energy crisis of the 1970s, and now, in one of the leanest times many of us have ever known. This summer will be remembered as the time kitchen gardens "came back.” Those of us in the gardening community had watched them fade for a long time and were resigned that another tradition would no longer be passed from genera­tion to generation. But the recent and sudden rise in oil prices has pushed up the cost of food dramatically, while sending the economy into a downward spiral that has cost thousands their jobs. Combine these worrisome changes with renewed concerns about the qual­ity of food and a genuine interest in food sources and suddenly, there is a renewed appeal to "growing your own." It has boosted demand at seed purveyors as well as the nurseries that sell vegetable seedlings. It has given new life to grassroots movements such as Kitchen Gardens International, a seven-year-old organization that promotes growing food at home. Kitchen Gardeners International made headlines earlier this year when its found­er, Roger Doiron, proposed planting ed­ible gardens in prominent locations, most notably, to replace the White House lawn. Closer to home, San Diego County is now home to two chapters of Food Not Lawns, a grassroots organization with a goal of "cultivating an edible future." The new: North County chapter recently held a tour of vegetable gardens where the mul­tigenerational participants bicycled from one garden to the next. Last month, the organizational meeting of One Garden at a Time, an offshoot of San Diego Roots Sustainable Food Proj­ect, was held. One Garden's goal is "to educate and help gardeners throughout San Diego develop their own organic vegetable, fruit and herb gardens ... also to provide a network of experts to assist wherever needed." But what about individual gardeners? What are kitchen gardens and what do they look like? Kitchen gardens are as diverse as their owners - in size, style, the effort that goes into them and the produce that comes out. Here are three examples, one traditional, one the work of two generations and one tiny and completely different. 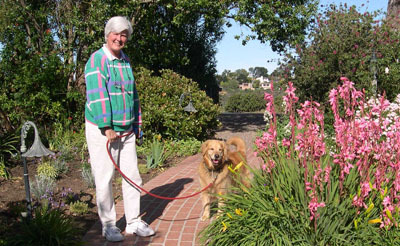 Long before Del Mar resident Linda Chisari became a garden designer, she was a kitchen gardener. As a child, she gar­dened with her grandfather in New Jersey. As an adult, Linda and her husband Frank, who is a scientist, lived for a while in France where they gained a love and appreciation for the terroir ~ the soil and the food that comes from it. "In France," she says, "they treasure soil like we treasure jewels." The Chisaris also grew to share the French way of valuing food. "French people taste everything, they don't stuff their mouths," she continues. "They are fussy about the quality of their food, which is why they dedicate space to growing food before ornamentals in their gardens." Like the French, the Chisaris put a high priority, on a home with a garden where they could grow food. When the couple was searching for a new home in the early 1970s, Linda saw an ad for a Del Mar house described as "perfect for a pool.” "To me," she says, "that meant it was sunny" ­which meant it was perfect for a vegetable garden. Unfortunately, the house on a corner lot was surrounded by asphalt. There was no bare dirt for a vegetable garden. The idea of taking up all the asphalt and amending the soil beneath was more than the couple could fathom. Instead, they set about breaking the asphalt in chunks over time, and replacing it with 4-by-8-feet raised garden beds that Frank built of redwood. They covered the remaining asphalt in gravel. Today, more than 30 years later, the as­phalt is just about gone and they have eight neatly organized garden beds that float in a sea of raked gravel. It is very much in the style of French country gardens. Linda starts most of her vegetables from seed sown directly into her garden beds, which are covered in bird netting to discour­age hungry four-legged and winged visitors. The netting also discourages Happy, their retriever, who thinks chicken manure fertil­izer is dog candy. A hose bib in each bed allows Linda to customize irrigation for each crop. Some beds are watered with micro emitters of a drip irrigation system but Linda’s favorite system is green soaker hose. 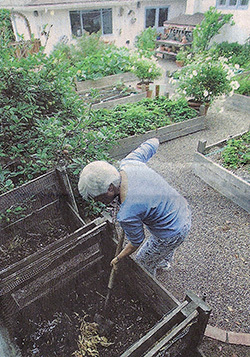 She composts all of her garden waste and puts it back into her garden beds, just as she learned to do in France. The Chisaris' 23-by-40 foot kitchen garden produces fresh fruits, herbs, flowers and vege­tables in all four seasons. Spring and summer are tomato season accompanied by zucchini, pumpkin, crookneck squash, cucumbers and .small melons. In winter, the garden fea­tures broccoli and a mosaic of greens, especially mache and arugula. "I love all kinds of lettuces," Linda says, "and beets, sugar snap and English peas, onions, garlic .... I always grow fennel because Frank is Italian and we like fennel. I use it as a celery sub­stitute in soup stock." A 50-foot-long border of fruiting trees and vines in­cludes an espalier of Beverly Hills apples that ripen in late May and Black Mission figs that are a late summer crop. Herbs are a mainstay, especially parsley, basil and cilantro. "I always have rose­mary, sage and thyme," Linda says, adding that these edible herbs double as landscape plants, "I use thyme to edge the beds and between step­ping stones. I use 'Tuscan Blue' rosemary as a foundation plant and my sage grows in the bed with roses." Linda cooks based on what is ripe. "I go out to see what is ready in the garden and then decide what to make for dinner," she says, "instead of deciding what to make and then going to the store to get it."